the Genie® GS™-3232 SCISSOR created quite a stir in the Australian market. From the south in Victoria and all the way up the east coast through Queensland, it seems that everyone is asking about the “3232”. All the fuss is well founded. The Genie GS-3232 scissor successfully combines an exceptional working height of 11.75 m (38’) on an electric scissor lift platform that fits through a standard door opening. This unit gets into indoor situations for maintenance and construction, previously denied! According to Brian Clifford, Genie Regional Sales Manager for Queensland, the appeal for the Genie GS-3232 unit is incredibly diverse. “We’ve got end users and hire companies talking about the GS-3232 scissor and crunching the specs of this amazing machine to see how it fits into their workspace,” said Brian Clifford. The Genie GS-3232 unit offers the very best combination of narrow footprint with a high lift. 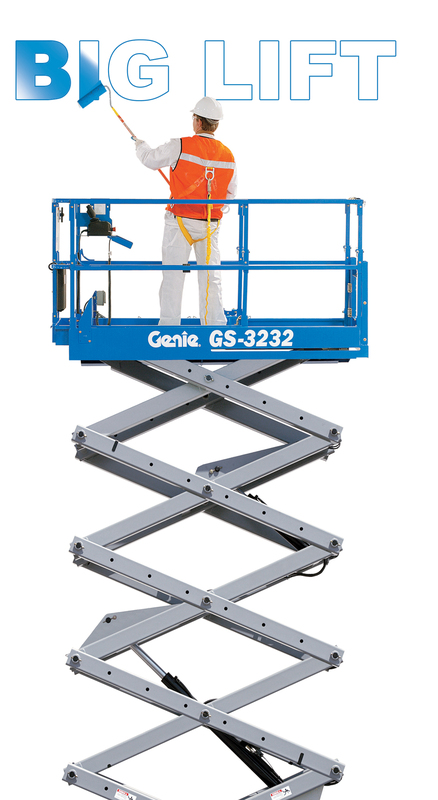 The Genie GS-3232 has the same footprint as the Genie GS-2032 electric scissor lift. Whereas the Genie GS- 2032 has a platform height of 6.10 m (20’), the Genie GS-3232 model reaches a full 12’ higher. Genie achieved this enhanced level of performance through the lifts' automatic levelling hydraulic outriggers. This system levels the machine on slopes up to five degrees. Quiet, zero emission electric operation makes this the ideal scissor lift for use in sound sensitive environments. A key attribute of the Genie GS-3232 scissor is its manoeuvrability. Renowned for excelling in narrow aisles with tight access, the Genie GS-3232 model is front wheel drive with zero inside turning radius.